My training with Terry Wildfong was an incredible experience that I will never forget. She is a kind and loving teacher who takes the time to make sure her students understand all the aspects of color analysis, color theory and the science of human visual color perception. Why couldn’t I wear the same colors as my daughters? Why did the colors that looked great on them make me look tired and ill? Does it have to do with your skin color? Hair? Eyes? If I found a makeup artist online, with similar coloring to mine, would her makeup look good on me too? Why do makeup artists have so much trouble getting my colors right? Why do I have drawers full of makeup? I just wanted a few lipsticks, blush and eyeshadows that I knew were my best… and be done with it. When I finally came across Personal Color Analysis, I didn’t realize what I’d stumbled upon. A whole new world opened up to me! I discovered that we are all made up of colors that are unique to us. All the colors in our hair, skin and eyes are in harmony with each other! All we need to do is find these colors that we resonate with in the natural world, and we will have our own color palette with our most beautiful colors! How amazing is that? In makeup and in clothing, when we apply the colors that are already within us, they look the most natural on us! So, now that I knew the secret, I needed to figure out which of the 12 Color Tones I could be. There wasn’t an analyst close by, and being a do-it-yourself type, I decided to try all the makeup suggestions for the seasons. I now acquired much more makeup, but this time it had a special purpose. I came to the conclusion that I was a Dark Winter. I ordered a color swatch book online and started to buy all my clothes and makeup accordingly. I even bought a dress for my daughter’s wedding in one of the colors I found similar in my palette. I knew it was the right color for me, because when I tried it on in the dressing room and took a picture to send to my daughters,it looked like my face was lit from within, and that I had just applied a fresh face of makeup. I had done nothing of the sort. I had travelled almost two hours on a train and walked maybe twenty city blocks to arrive at the department store on a warm, sunny day. I was a tired mess. This is when I realized that there really is something to this! I decided to train with Terry Wildfong to be a certified color analyst in the 12 Tone system. After days of practicing and analyzing other people, it was my turn to sit in the chair and watch Terry do my color analysis. I figured it was going to be somewhat boring, as I ‘already knew’ what seasonal tone I was. However, I thought it might be interesting to watch the process unfold on myself after seeing it on other models. The draping was not as straightforward as I’d imagined. I seemed to be somewhere between Winter and Autumn, although there was something about the Spring brightness that we liked. In the end, it came down to one of the Winters; Dark, True, or Bright. It was difficult to decide between Dark and True, so Terry took some pictures which were helpful, but I was so close that we needed more information. Terry took out the Luxury Drapes. She placed the Dark Winter over my shoulders and proceeded to uncover all the beautiful colors. I watched in amazement as all the colors ‘I thought I was’, had little effect on me. I had draped a Dark Winter woman during my training, and after Terry applied the correct makeup and placed the Luxury Drapes over her shoulders, there was magic! There sat a woman more beautiful than any model you could find in a magazine! So, where was the magic for me? I thought maybe this isn’t all I thought it would be. The colors were alright, but none did anything special. Terry looked at me and said, “This isn’t working, is it?” I shook my head no, and she proceeded to take out the True Winter Luxury Drapes. When I turned around and saw her carrying them in, I knew! I knew instinctively that those were my colors! As she placed them over my shoulders, the magic began! Now that we were sure, she added the correct makeup colors and sat me down again to experience my colors in all their glory. As she placed each color over my shoulders, I saw for myself what I was made of and how I resonated perfectly and beautifully with all the colors in my palette. The correct lipstick on me was perfect with all the colors, because everything was in harmony. There is nothing like the pleasure a mother gets from seeing the true beauty of her daughter. This was true for me as well. When I arrived home and draped my own daughters, it was like seeing them for the first time. As I packed up, getting ready to leave, Terry looked at me and said ” You know, the sweater you are wearing is Dark Winter.” I said “Yes, I know. I’ve been wearing it often, thinking I must look great in it. This is also the year that I first started noticing myself aging.” I realized then that it was because of the dark, cool neutral clothing I’ve been wearing. So, there you have it – your correct colors will make you look your youngest, freshest, most beautiful self! The Process: Under full-spectrum lighting, in a neutral gray environment, we will begin the testing process. You will be seated comfortably in a chair facing the mirror. You will be given a gray scarf to cover your hair, and a gray smock to cover the color of your clothing. Your skin will be free of makeup. After a brief explanation of color analysis, human visual color perception and the distinct qualities of the 12 Tones, I will stand behind you and drape colored fabrics (called drapes) over your shoulders and beneath your face. 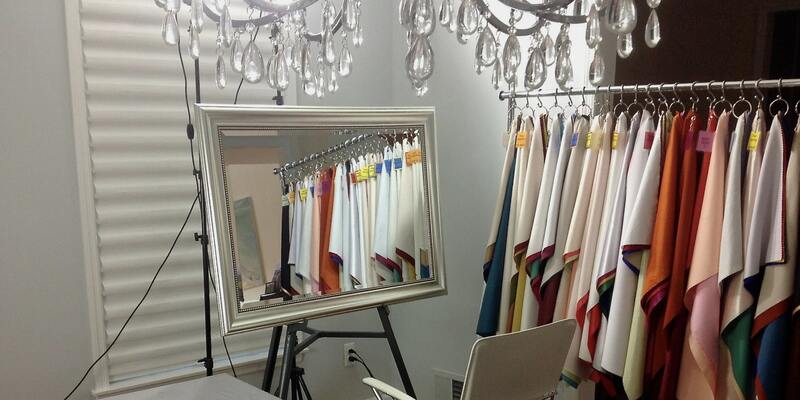 I will compare two drapes at a time, and we will watch for any positive or negative reactions in your face. As the process continues, you will begin to see for yourself, and understand, what color can do for you. 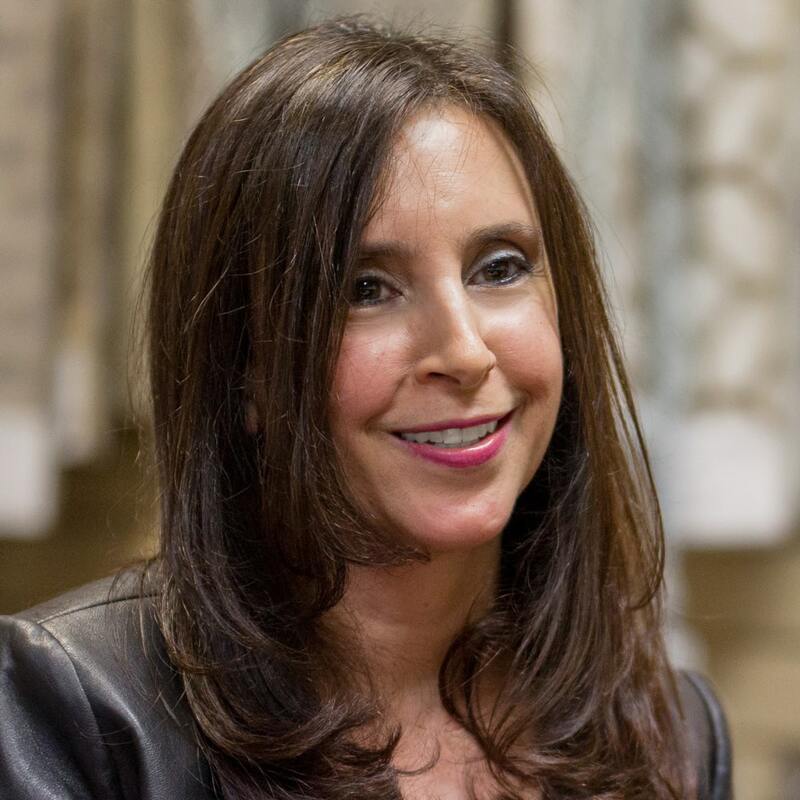 The Key Drapes: Black, Brown, Gold and Silver to determine cool, warm, saturated or soft. The Red Test: Four levels, from lightest to darkest, to determine warm, cool or neutral skin tone. The 12 Test: The most likely seasons will be tested against one another to determine your best color tone. 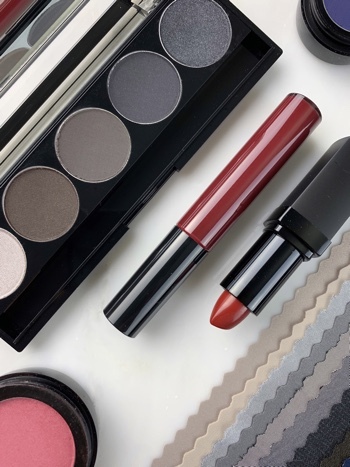 The final season is chosen, and you are shown the correct makeup colors and how to harmonize your color fan with clothing, makeup and accessories. The Luxury drapes: 15 of your most beautiful colors are draped around you, one at a time, so that you may experience the splendor of your personal color tone. I am a mother of three, with several grandchildren (and counting). I have a B.S. Degree from Rutgers University in Environmental Planning and Design, and Landscape Architecture. I work part time in my own landscape design business. My passion is to help everyone discover their own unique, authentic beauty. Dear Nadine, I want to thank you for a most interesting and eye opening journey into the world of color and how to use it to promote a harmonious and flattering presentation of one’s self. I am mostly impressed how well informed and studied you are. Your eloquent manner and diligence of your art form convey to your client both discovery and education. You made the process so very enjoyable, and it was a wonderful experience for me. Hi Nadine, I just wanted to reach out and tell you thank you. I never realized how the right color, and shades for that matter, can make such a difference. 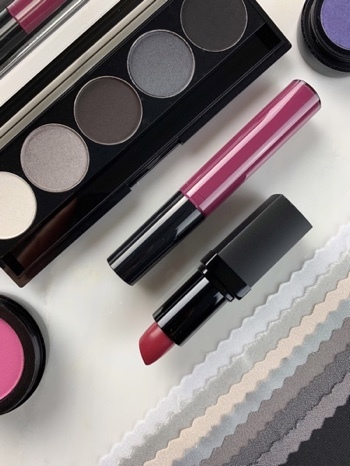 I sat in your chair, not knowing what to expect, and as you started to pin down my color palette, by placing colors up against my face, I realized that not only was I looking prettier, but I was feeling happy! My whole mood changed. I was absolutely amazed! You also made it so much fun. You were reassuring when I was doubting myself, and you kept me laughing as well. You changed my life in a colorful way. Thank you so very much for everything. Like most analysts, Nadine has shared a desire to help others through color analysis, due in part to her own color experiences. She has a discerning eye, is thorough, and stays with the process until she is satisfied she has reached the best result for her client.